Airtel postpaid package with the lowest call rate and attractive internet offer! Today we will discuss the details of Airtel postpaid package call rates and internet offers. Bundle offer: There are also great bundle offers. Any Airtel or Robi Customer Care will be able to purchase Airtel’s postpaid new SIM, Or if you are an Airtel prepaid subscriber, you can update your SIM on Postpaid package. Airtel postpaid packages can talk to be 45 Paisa per minute with the 1-second pulse. 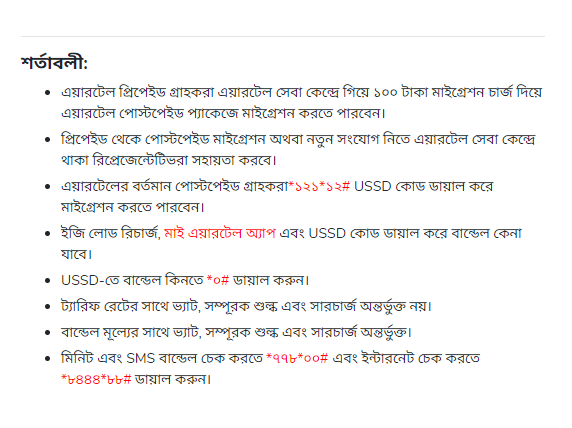 Airtel Postpaid SIM Call Rate Offer! Representatives are available in the Airtel service center for postpaid migration from prepaid or for new connections. To buy the bundle in USSD, dial *0#. Airtel prepaid subscribers will be able to migrate to Airtel Postpaid Package with Tk.100 Migration Charge at Airtel Service Center. To check the Internet, dial *8444*88#. A bundle will be purchased by dialing Easy Load Recharge, My Airtel App and USSD Code.